NES Cheetahmen II (USA) in 01:11.68 by adelikat. Cheetahmen II is the unfinished sequel to game #52 of Action 52. 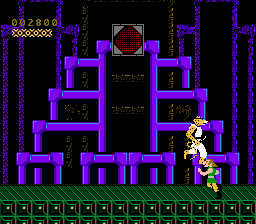 The game contains 6 of the 10 levels originally proposed, in which the player takes control of Apollo, Hercules, and Aries, switching off every two levels. This is the first movie to abuse the fact that some games do not initialize their states before reading them, which in this case results in one of the cart registers randomly taking a certain value that can force the game to start from level 5 on power-on. Since the game really behaves like that on the console, it was decided to allow presetting such truly random bits on the emulator side. Read the submission text and its discussion thread for more details. We also have an "all levels" TAS for this game, done on the patched ROM due to a bug in the original game preventing the player from progressing past level 4.